We all hit a dry spell every now and then, right? Well, trying to get my feet wet again with card making (and blogging), so here it goes for Simon Says: Gift It -challenge! This is a specially made shaker card for twins with their initials on the card. I used Simon Says Stamps "Tiny Ray of Sunshine" -stampset and corresponding "Baby Clothes & Crib" die-set from a couple of years back for the card. It seems my old linking tool had disabled thumbnail images for free subscribers, so I guess I'll skip it for now. Gorgeous shaker card Nunt! 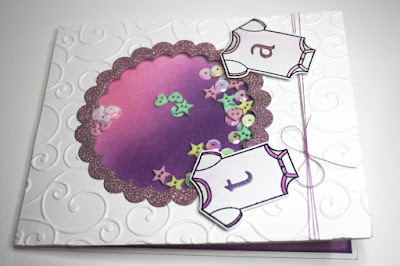 I love the embossing and the baby grows are so cute. Want to see the furry kids? Craft blog (knitting, YARN, papercrafts and stamping) with inserts of general complaints about life - partly in Finnish :) **** Nunt @ Ravelry **** I am a Finn by birth, but relocated to Norway at the end of 2007 - after a man, why else ;P **** Suomalainen luita ja ytimiä myöten, mutta Norja kutsui miehen perässä vuonna 2007.